INDIAN WELLS – Novak Djokovic reached another relevant milestone in his professional career when he accomplished his impeccable mission in the Californian desert. The world No.1 player who lost only 2 matches (vs.Karlovic in Doha and vs.Federer in Dubai) this year, showed again his absolute dominance in the men’s tennis during the entire tournament. By . . .
New York City, USA – 17 time Grand Slam champion Roger Federer should leave his beloved Garden with mixed feeling after he lost first time against his proclaimed successor, Grigor Dimitrov. 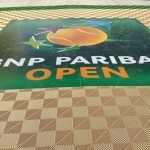 The second highly anticipated clash of 2015 BNP Paribas Showdown was following the Seles-Sabatini match where the Argentine defeated her former nemesis. Before the . . .
NEW YORK CITY, USA – It was a typical November day in 1990 when Monica Seles and Gabriela Sabatini collided in the final of the Virginia Slims Championships at Madison Square Garden. That night, they met just the second time during their pro careers after Gaby beat Monica two years earlier 7-6 6-3 in the . . . Although Kei Nishikori defeated Milos Raonic 3-6, 6-3, 6-4, 2-6, 6-4 and forced the decider for his team, however Go Soeda was beaten easily by Vasek Pospisil 7-5, 6-3, 6-4. 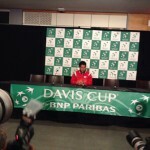 Team Canada clinched its maiden victory against Japan and advanced into Davis Cup by BNP Paribas Quarter-finals. Day 3 started with one of the most . . .
Daniel Nestor and Vasek Pospisil completed a historic win when they beat Go Soeda and Yasutaka Uchiyama 7-5 2-6 6-3 3-6 6-3 on Saturday at Davis Cup by BNP Paribas World Group first-round tie in Vancouver.By this crucial victory, Team Canada takes the lead 2-1 after Day 2 and moves one step closer to the . . . 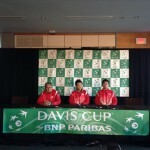 The Canadian Davis Cup team is tied with Japan 1-1 following the opening day of action at the Davis Cup by BNP Paribas World Group first-round tie in Vancouver. The two No. 1 players of their team secured victories on Friday, with world No. 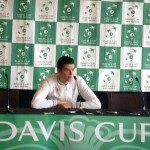 6 Milos Raonic defeating Tatsuma Ito 6-2, 6-1, 6-2 and world . . .